It is a habit of grinding or clenching the teeth. It can develop at any age, and children as well as adults can have the habit of grinding their teeth. Symptoms include a dull headache or a sore jaw; frequent toothaches; facial pain; worn tooth enamel; earache; insomnia. You could have teeth that are painful or loose from severe grinding. This can lead to fractures in your teeth. 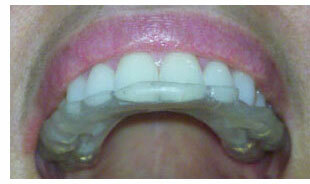 We can fit you with a mouth guard to protect your teeth during sleep. It slips over your (either upper or lower) and prevents contact between them. It helps relieve the pressure of grinding or clenching which can damage delicate jaw joints. Don’t make your teeth the brunt of your stress. Ask Dr. Medvesky if a night guard is the answer for your situation. If a patient has a history of TMJ disorder, the doctor may prescribe a muscle relaxant prior to and after the procedure to alleviate any jaw joint tension.